Bernie Ecclestone says he has no immediate intention to retire as Formula 1 boss, suggesting he may continue for around three more years. Ecclestone, who turns 82 on Sunday, has controlled the commercial aspects of the sport for more than 30 years. 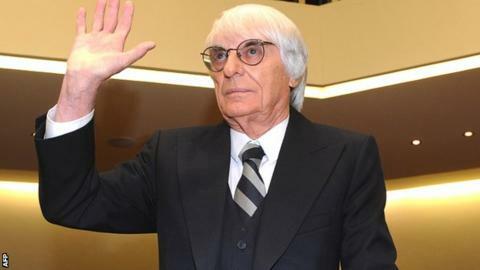 "Eventually I'm going to go, one way or another," Ecclestone told BBC Sport. "But as long as I feel I can deliver, and the shareholders are happy for that to happen, I will stay. When I can't I'll give them plenty of notice." After it was announced in May that F1 was to float on the Singapore stock exchange, Ecclestone's future would inevitably have been a key consideration for potential investors. Having been at the helm for 17 years, the stability of his continued leadership could prompt greater interest in the IPO (initial public offering, where shares are sold to the public for the first time). But the IPO prospectus mentioned that recruitment experts would be employed to identify Ecclestone's eventual successor, implying his reign may be drawing to a close. Although the flotation was delayed by weak market conditions Ecclestone hopes it will take place in 2013 - but the Englishman insists stepping aside is not on the agenda. "When we decided we're going to get an IPO, the obvious thing was 'well, what's going to happen about Bernie?'" said Ecclestone. "So we put in the prospectus that we're going to find a head-hunter to try and find someone. That was a couple of years ago. "But as long as I feel I can deliver - and they're happy for that to happen - I will stay. "I will tell CVC [F1 owners] exactly if I'm going to turn it in when I'm 85 or something like that, which will give them plenty of notice."